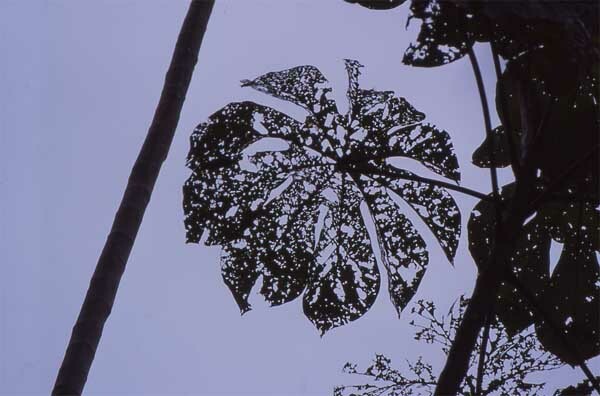 Most rainforest insects eat plants (they are herbivores), although a mosquito-bitten tourist might think otherwise! This ecological pressure is one of the main driving forces behind the evolution of plant diversity. 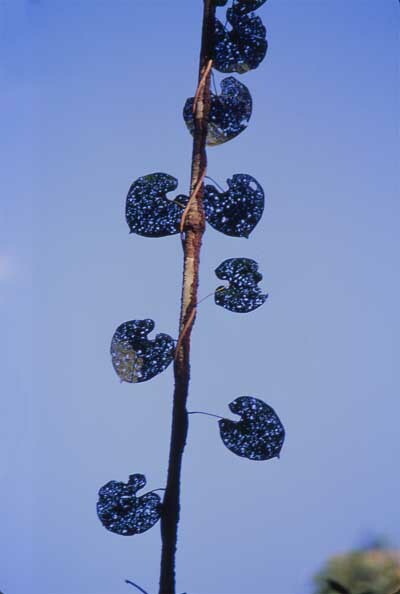 Plants produce toxins to inhibit insect herbivory, and in turn insects evolve ways to overcome the plant defenses. Sometimes, the plants just lose out, as shown in these pictures. Such plants will produce fewer fruits than better-protected individuals and will be less likely to pass on their genes to the next generation. These leaves belong to a type of vine (Philodendron?) that was winding its stem around another climber. It's hard to say what kind of insect was responsible, but it may have been a type of caterpillar.